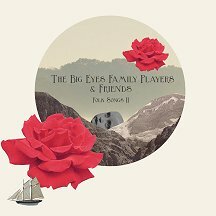 On 6 August 2012 The Big Eyes Family Players & Friends are to release ‘Folk Songs II’, a continuation of 2009’s ‘Folk Songs’. The 12 track album, (also available as a special limited edition with 3 further tracks and postcards) features the following singers - Alasdair Roberts, Nancy Elizabeth, James Yorkston, Elle Osborne, Mary Hampton, Adrian Crowley, James William Hindle, Heather Ditch and Sharron Kraus; The musical arrangements were made by James Green (guitars /piano/ harp / zither / drums / percussion / organ / cello / glockenspiel / backing vocals), as well as Brian Ellis (bass guitar), David A Jaycock (synths / organ / drums), Paul Fletcher (percussion) and Lindsay Aitkenhead (viola). ‘Folk Songs II’ by The Big Eyes Family Players & Friends finds the boat has been pushed out a little more. The songs and stories are more sprawling, and arrangements show further disregard for any folk tradition than the previous ‘Folk Songs’ outing. James Green admits openly to not knowing much about folk music, or particularly having much time for folk authenticity. The aim was simply to illustrate the songs and the voices in the most appropriate way, and the only way that the Big Eyes Family can. ... It soon outgrew the bedroom and a band was formed. Big Eyes recorded 4 albums over the next four years (for Pickled Egg Records) and split up in 2004. After this, The Big Eyes Family Players were formed, as a more collaborative arrangement. So far, they have worked with people like Jeremy Barnes (A Hawk And A Hacksaw), Terry Edwards (Gallon Drunk/Tindersticks), Rachel Grimes (Rachel’s), James Yorkston, James William Hindle and many more. The Big Eyes Family Players are currently based in Sheffield, UK and they dwell somewhere within chamber music, folk music and perhaps pop music; guitars, strings, harmoniflute, organ, bass, drums, flute, sometimes vocals and other bits and bobs. The interest in recording folk material first started with the recording of the ‘Warm Room’ album in 2008. It was conceived as an ‘ode’ to folk music, so not a ‘folk album’ per-se, but a distilling of the elements that make up the form. It did however contain one traditional number, being ‘False True Love’, based on the Shirley Collins version. Shortly after this, and totally unconnected to it, James Yorkston put the idea to them to collaborate on an album of traditional material. They agreed, and the album was completed in January 2009, with the help of Nancy Elizabeth, Pip Dylan, David Wrench and Luke Daniels. The band also went on a tour of the UK/Germany with Mr Yorkston in late 2009 in support of the album. At the end of the ‘Folk Songs’ tours, James (Green) was considering what Big Eyes should do next. Mr Yorkston suggested another folk songs album, this time with a selection of singers/collaborators. James didn’t take that suggestion particularly seriously, but the seed was sown. Shortly after returning home, James contacted a few of his favourite singers and asked if they’d like to contribute to an album of traditional songs (and choose songs). They all agreed, somewhat surprisingly, and here it is.